I remember the days when my grandparents raised chickens. I remember walking into their bright red chicken house as a child and scattering the oats and watching those chickens scatter and flap their wings, feathers flying, all the while bawk, bawk BAWWWWWWWWWWWWWKKKing! Then we would gather eggs from the straw nests, sometimes coming across the stubborn hen that wouldn't get off her nest. Yes, a visit to the hen house is a regular barnyard romp -- those chickens move about in their own sort of chicken dance rhythm. No, this dance has nothing to do with that silly dance people perform at weddings and such. It's just bawking and flapping and shaking to the ordinary chicken beat. Now just imagine what kind of ruckus there would be if the poultry equivalent to Elvis happened to enter the hen house. Well, you don't to imagine. Tammi Sauer pretty much covers it all in her newest book, Chicken Dance , featuring that famed Elvis Poultry and a couple of infatuated hens, Marge and Lola. It all starts with a poster announcing a talent show. The grand prize: tickets to Elvis Poultry in concert (the final Doodle Doo). Marge and Lola, the desperate hens, want those tickets. In order to beat the cocky ducks and other rivals, they need a talent. Finding a talent is easier said than done, and they quickly discover tightrope walking really isn't their thing. Marge and Lola end up "winging it," and compete against some stiff competition including tractor eating goats and leaping cows. Will they rock the house and get their chance to meet the crooner, Elvis Poultry? Or will they "fowl"-up? This barnyard frolic made us laugh and laugh and laugh. The creative and humorous play on words makes it especially fun for adults. My daughter loves the depictions of the chickens trying to find a talent - bowling, swimming - it all makes her giggle. Dan Santat perfectly illustrates Elvis Poultry, resplendent in a white, rhinestone studded Elvis suit, and the action packed images of the performing chickens steal the visual show. The book jacket is hilarious, and the back cover looks like an LP record cover featuring songs like "Jailhouse Bawk." There's even a moral to this children's story. The "don't be a chicken" and "be yourself" messages ring out loud and clear. 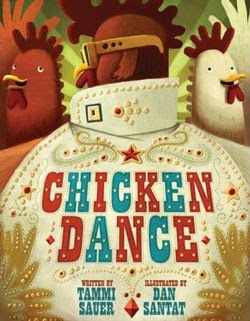 Chicken Dance is an all around, blue-ribbon winner of a picture book! I just started one and I've love to have you stop by.